In between inhaling and exhaling, you will normally experience a short pause in the breathing cycle which does not normally occur except when yawning. Yawning is an involuntary deep breath, usually with your mouth open, followed by a slower exhale with your mouth closing. 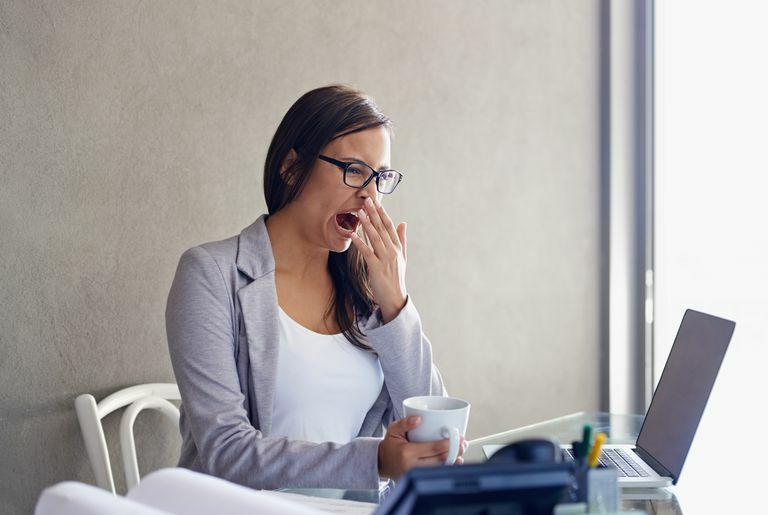 It is often considered contagious—you'll likely yawn when you see someone else yawn, see pictures of someone yawning, or if you even think about yawning. Why does that happen? Yawning is believed to be related to feeling bored or sleepy. However, this is an over-simplification. Drowsiness or sleepiness: Yawning commonly occurs when sleepy. There are some thoughts that yawning is actually stimulating and a counter-measure to falling asleep, but there is little evidence to support this. Yawning most likely occurs simply as a result of being drowsy. Decreased arousal: You yawn when you are in a less stimulating environment (i.e. you're bored). Contagious yawning: This is induced by witnessing another yawn. Thinking about a yawn is also known to cause one. Chemical causes: Androgens (like testosterone), oxytocin, and some medications like Prozac and other antidepressants can increase your frequency of yawning. An ear protective mechanism: While it is true that yawning can equalize pressure between your inner ear and the outside atmospheric pressure by opening your Eustachian tube, it does not appear to be an evolutionary adaption to protect your ear. Other methods can also equalize pressure in your inner ear, like chewing gum and drinking. Regulation of brain temperature: It has been observed that a hot and cold pack on your forehead can change your likelihood of yawning. However, it is more likely that the hot pack induces yawning by decreasing your arousal state, while a cold pack increases arousal and decreases the number of yawns. Your circadian rhythm may also play a role in this. A response to decreased oxygen and increased carbon dioxide: While this was a common belief for a while, there is no evidence that this is indeed true. Note that you can not simply yawn on command—the act is an unconscious reflex. Reflexes with prolonged time of reflex are harder to reproduce, unlike the knee-jerk response that is done during physical examinations, which is a fast reflex. Did you realize there are actually different ways to yawn? Nose yawn: By sealing your lips during the exhalation phase of the yawn, you can actually yawn through your nose. Eyes-open yawn: Your eyes typically will either close or squint during a yawn. By propping/forcing your eyes into the open position, you can actually block or stall the yawn. You may also block others from yawning form doing so, as squinted eyes is a potential trigger to yawn since that facial feature is associated with yawning. Clenched-teeth yawn: When you feel the yawn starting, clench your teeth as you inhale. This tends to be described as an unsatisfactory yawn. Equalized pressure: Yawning equalizes pressure in your inner ear by opening your Eustachian tube. Social cues: A yawn can offer a clue about how you're feeling. You may consider this a disadvantage as well. Stimulating effect: Yawns are thought to stimulate arousal and increase vigilance when you're sleepy. This is a result of mechanical stimulation of receptors in your neck called carotid bodies. Yawning helps to prevent your lung from collapsing. Yawning helps renew surfactant in the lungs, which helps with breathing. Yawning helps to remove debris from your palatine tonsils. Seeing a picture of a yawn. It is believed that the contagious yawn has a social meaning and is more prominent in similar groups. For example, you may be less likely to yawn when you see your dog yawn than when you see someone yawn at work or in another social setting. It is also believed that children less than 5 years old do not experience contagious yawns due to a lack of socialization skills at an early age. Some scientists support the idea that yawning serves an empathic (understanding of feelings) function. They tested this hypothesis by identifying populations that have a reduced tendency to yawn, like those with autism and schizophrenia. It has been observed that when someone with schizophrenia is in a healthy state of mind, they tend to yawn more. Another theory is that yawning originated for social, non-verbal communication of your state of mind. Usually, yawning is associated with boredom and drowsiness and therefore considered disrespectful in social environments. It can also signify hunger and mild stress. Pay attention next time you yawn—were any of these factors at play? Guggisberg, AG, Mathis, J, Schnider, A & Hess, CW. (2010). Why do we yawn? Neuroscience & Behavioral Reviews. 34(8): 1267-1276.